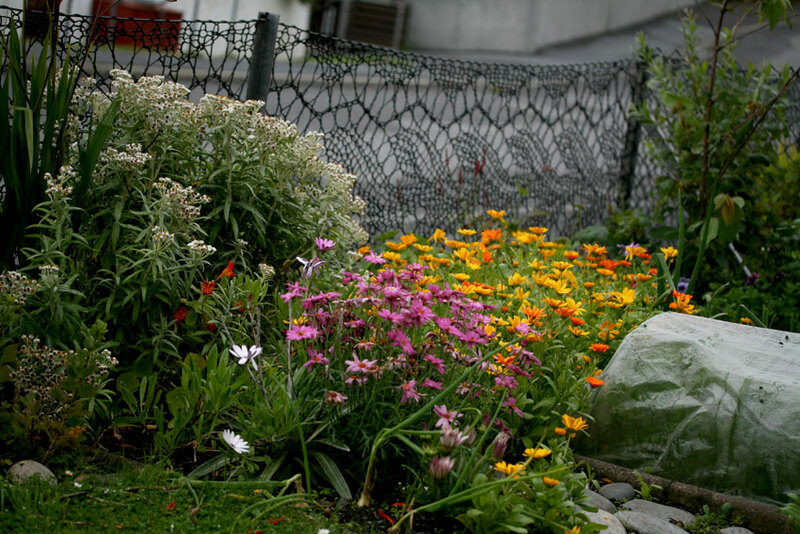 A fence and a flowerbed? Take a closer look . . . for this is no ordinary fence. 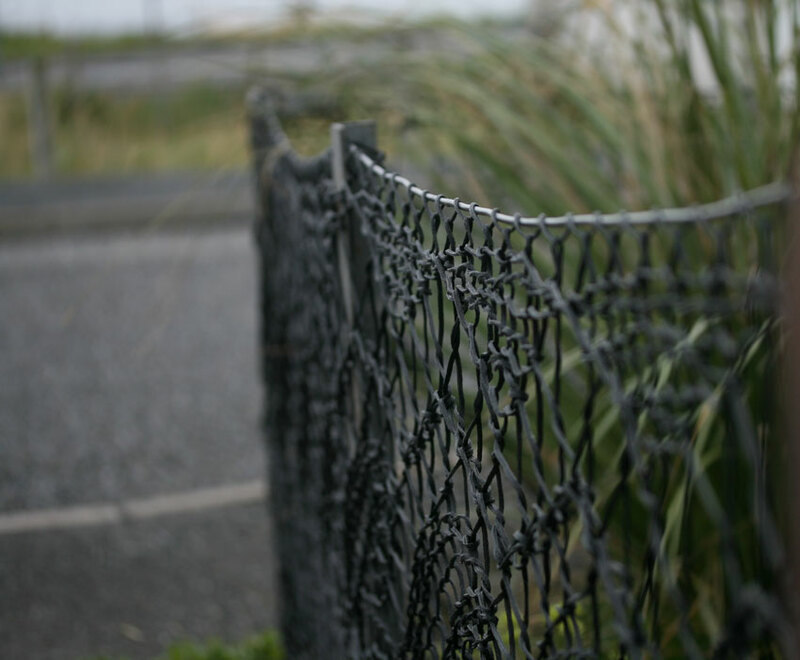 . .
. . .this is a knitted fence . . .
. . . a Shetland lace fence, no less. This beautiful and imaginative creation is the work of Anne Eunson of Hamnavoe, Burra. Anne loves lace knitting, and how better to express that affection than by completely wrapping one’s garden up in Shetland lace? The fence is fashioned from strong black twine (the same kind that is used to make fishing nets) and Anne knitted it up on specially adapted curtain poles. 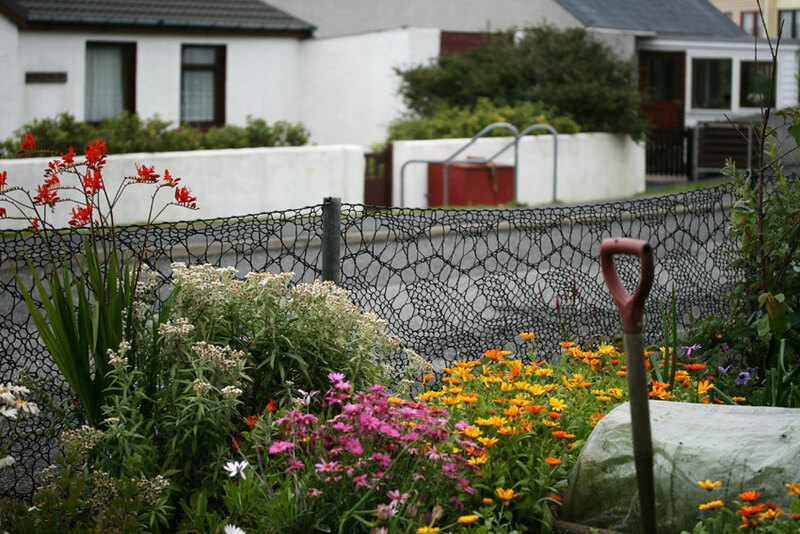 It took her about three weeks to knit enough lace to surround her front garden, using a 23 stitch repeat of a familiar Shetland lace pattern. It kills me how the pattern is revealed so strongly, as if it were stretched around the garden on gigantic blocking wires. I gasped when I saw it and really think it is just about the most beautiful fence I’ve ever seen. I love the way that the lace and Anne’s planting speak to and interact with one another, as the heads of daisies peak through the yarnovers. It is as if the flowers are wearing a shawl, and the shawl has been decorated with flowers. A knitterly Eden! Anne told me that she was really pleased with the finished fence, and says that she now has plans for further lacy additions to her garden. Watch this space, Shetland! Thanks so much, Anne for your kind permission to write about your work and reproduce these photographs. Just think this is so beautiful!!!!! So the leaf motif I see. I absolutely love it! I love this! What a unique idea. Thanks for sharing! Wonderful! I’ve always felt that we could vastly improve on chain-linked fencing! I am at a loss for words to describe how I feel about this amazing fence. It’s one of the most beautiful things I’ve ever seen, I truly wish I had thought of this for my garden when I was younger. The esthetic beauty of it is so special. I awoke to a friends chat suggestion that I check out your site and I am so happy I did, what a lovely way to start a spring morning in Michigan after our hard winter. this is beautiful and amazing and inspiring! 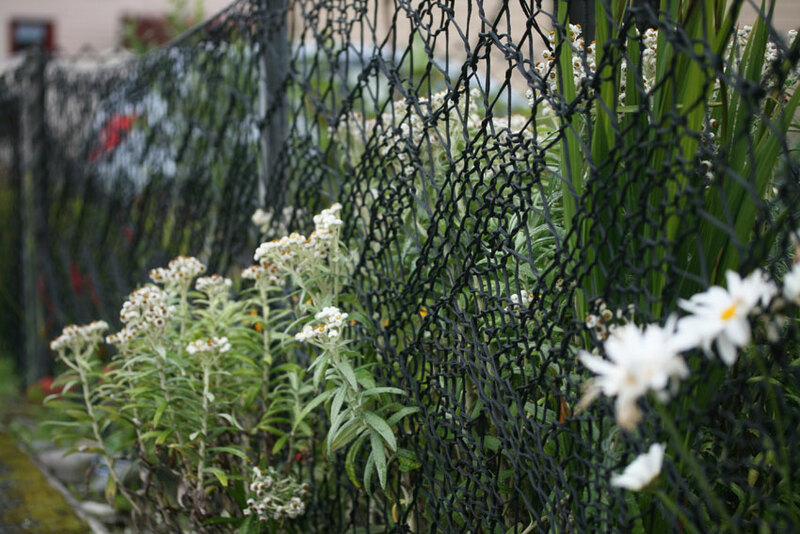 Just curious as to how your knitted fence has held out for these few years? It sure is gorgeous. Being a knitter and having knitted a few things with lace patterns I can appreciate the time and labour that has gone into your work of art! It’s been in situ for 3 yrs now and it’s just as it was. Glad you like it. Stunning and creative, thanks for letting it be seen worldwide! It’s been in situ for 3yrs now and is just as it was. Glad you like it. I wonder if broom-handles would work as needles? Could animals, like rabbits for example, chew through this strong, black twine? That would be too much work if so although it is so exquisite that I would love to have one in my yard. This is a beautiful way to incorporate knitting into your environment. I wouldn’t call it knit graffiti at all, but it is very closely related. 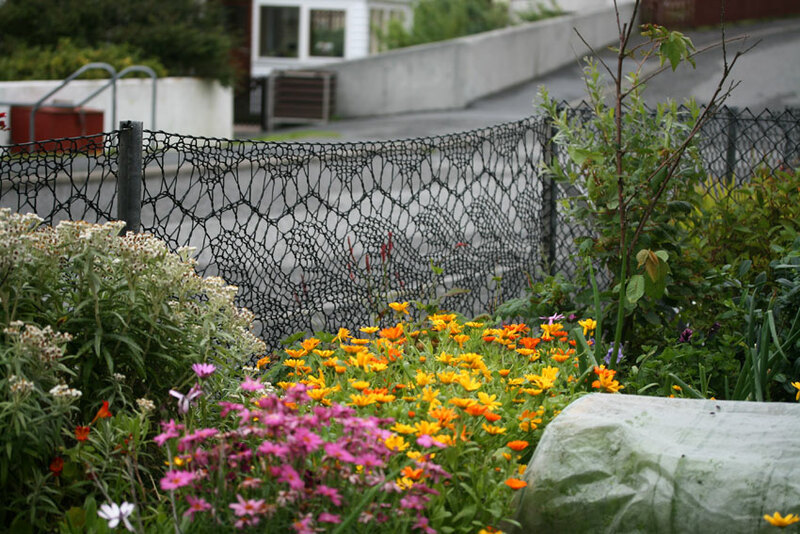 A garden fence knit out of twine. Simply beautiful! Is there a pattern for this fence?? Or some guidance on how to make it?? Gorgeous!! Yes I would but a pattern for sure. Please share. Would like very nice at my barn. You could use any lace pattern you like, really. You’d just have to adjust your gauge… a lot! Love it, so unique! As if I don’t have enough to knit every winter…now I want to make one of these! It was a curtain pole which a friend of mine turned into a pair of knitting needles. Just lovely, Anne. Any chance you could share photos or video of the process? (Maybe just post them as “public” on your Facebook?) Such a clever idea; I know many would like to try it, or just see how you did it! Thanks for sharing these photos! So much fun to see. I am inspired and in awe. What an amazing creation! I think we all have an obligation to try and make the world around us more beautiful in whatever way we can, and you have succeeded spectacularly. Thank you for sharing the artisty of the fence. I have seen a photo of some and wondered about the process. So refreshing and practial! 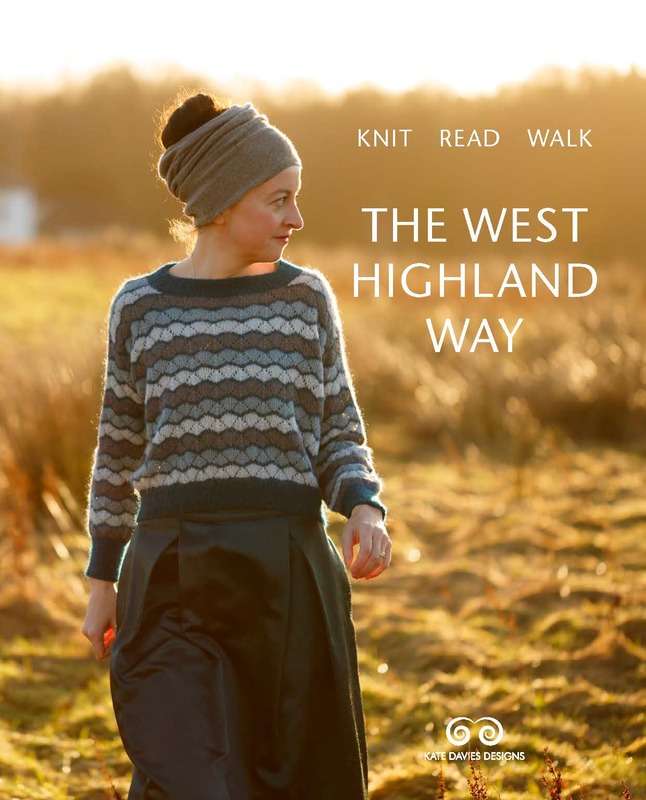 I am travelling to Shetland for wool week and would love to catch a sneaky peek of Anne’s gorgeous fence. I wonder if she is going to any of the wool week events? What about running a coach trip from Lerwick Anne? It’s the most beautiful way to do up the pretty garden! Hats off to Anne! It’s beauty she has created! I finished a lace shawl a few months ago that used that EXACT design in it. Surreal and beautiful, like the fence around a doll’s house! WOW – Do you have any fingers left..? How big were the curtain rods? OH wow… please publish more information on how you did this. Please Please. I love this. I would really like to see a picture of her modified curtain rods. This would be a blast to make. Thanks for sharing. If you go onto Shetland Arts & Crafts Association Facebook page, July 20th post, you will fine photo of needles. Isn’t that brilliant? So impressed. Yes I do have a facebook account- just Marsha Edwards. There are probably many by that name, mine has a picture I took in Hawaii, palm trees and blue water. I do not post very often- maybe I will get better about doing it. Yes, let’s try to keep in touch. Email is probably a better way, I am not sure how to send it to you. Any ideas? Glad to know you do remember me! Can’t find you on Facebook, it might be easier for you to find me. It’s just Anne Eunson and the picture is a close up of my fence. Years ago the Folklife Festival-held every summer- in Washington DC- featured knitters from Shetland. Ann Eunson was one of the knitters who came. I had the privilege of hosting dinner one night for Ann and another Shetland knitter- also an Ann.I invited all my knitting friends that I could round up at the last minute. It was a miserably hot summer night in DC, but everyone was in rare form and we all had a great time. My only regret was that I never kept in touch with either Ann. She may not remember me, but I remember her fondly. Please pass on my greetings and best wishes. Her fence and garden are beautiful. Hi Marsha, I just tried to post a reply to you but got it WRONG, posted a comment instead. so check out the comments. Okay, not sure if my original post went elsewhere or just disapeared. Looking for some help in finding the pattern for this as a very dear friend wants this for a housewarming gift. I can do the knitting but need help finding the pattern!! Thanks much! What a beautiful fence/piece of art/statement/innovation/out of the box solution. Quite inspiring I must say. I am ready to tackle this for a dear friend who wants one for a housewarming gift, but I am clueless about the pattern. Can someone tell me either the name of this pattern or where I can find it? I figure since I once had to make 2 foot long needles out of wooden dowels to knit an afghan (for the same dear friend) I can make needles out of larger wooden dowels or rods or something. And after she gets one, I get one… Thanks, Anne, for such a lovely inspiration. Truly breath-taking. Ditto – I too would really like to know the 23 stitch repeat so I could try this too here in Canada. Does anyone know if there are instructions? I’m really surprised that I couldn’t find anything on Ravelry. Anne could be making some good income by selling her fence pattern. My alert put this in junk! Outrageous. It’s quite the most lovely thing I’ve seen for ages. Thank you Anne. And thank you Kate. Beautiful, but will it keep the neighbor’s kids out of my yard? Well it keeps my neighbours kids out but wish I could say the same for their CAT!!! Will need to remember and knit some Cat Traps in the next piece! Absolutely stunning. And very inspiring. S T U N N I N G!!!!!!!! Yes, fairy like and so useful! thank you for posting such an art form. And I just knit socks?! If she can knit a fence, I can knit a treehouse…. There is a fairy tale by a famous Latvian writer Imants Ziedonis, written in early 80-ies. It tells of an iron man out of iron, with an iron heart who is haunted by iron things – he builds many fences but none of them guards his house against the iron visitors such as old forks, razor blades, or even meteorites – and the problems they cause. And everything becomes right in his life when he meets a fairy who does him a fine fence, albeit in crochet, not knit. “You need less of iron, and more of softness and wool.” As soon as I saw the fence I thought of the tale. The link will take you to the fairy tale in Latvian, google translates it very crappy, but the story will come across anyway. Very interesting story!!! Good to use as a therapeutic tool.. Also, as a spinner/knitter/crocheter/healer, I find that there is something magical about wool. 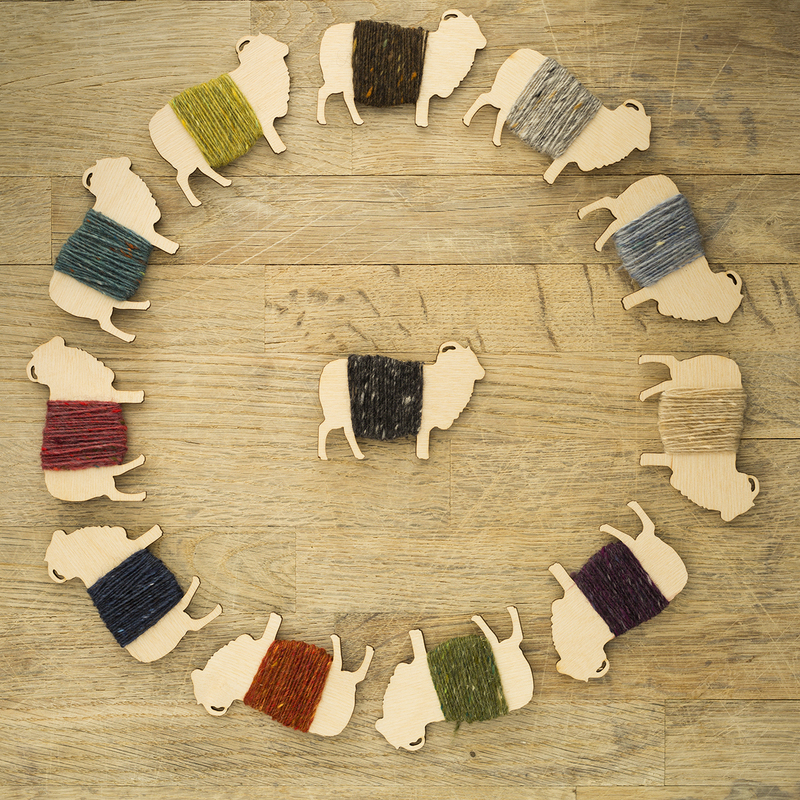 When I am working with wool I find that healing energy, in the form of symbols and archetypes, influences my choices of colour and form. So I find this story very interesting on lots of levels. Thank you for posting the link! Please Miss, Can I have the directions………? That is absolutely amazing!!!! I love it! I was wondering how it manages to survive in the rain but then, reading further, all was revevealed!!!! Twine. Ingenious! I just managed to rescue two wooden curtain poles from the recycling pile before the bin men arrived. Phew! Oh my god, that is stunning! That is so amazing, I feel like I am dreaming … the patience, the talent, the imagination. Just…Wow…absolutely beautiful fence and certainly one of a kind! Thanks for sharing. Such a lovely fence … it takes my breath away. 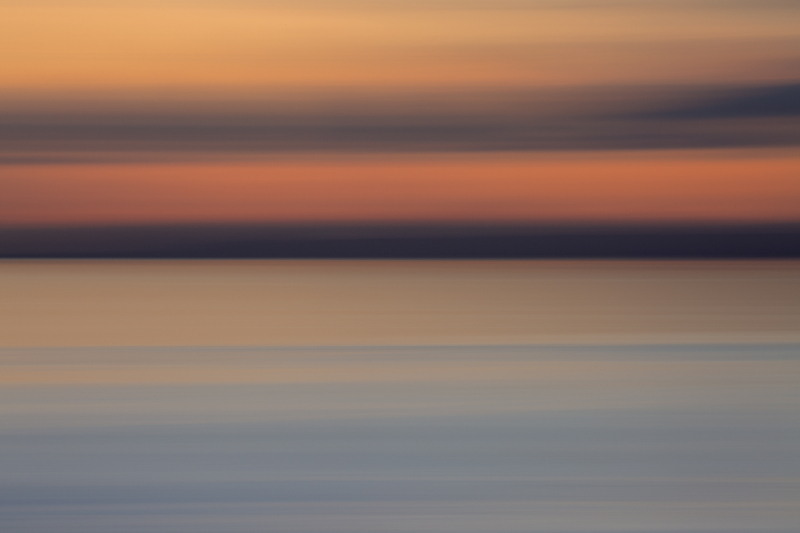 Breathtaking – like being in a dream. This is pure art. Crikey! How did she persuade her husband to let her do that?! Stella, I don’t have one!!! Well, I think your fence is beautiful – you’re very clever and a lucky lady! Anne–I doot you wid nivver be aksin a man for PERMISSION!!! I wiss I hed gotten me bridder ta tak me doon ta see it whin I wis hem for UHA. A’ll hae ta mind ta come an see your lovely wirsit fence nixt time A’m hem. It is an amazin thing. Cheers. Weel Peg, duna joost come tae see me fence……if I’m in da kettle is usually on. Gorgeous! What a novel idea! This is so beautiful, and what a fantastic idea! Gives new meaning to the word STUNNING! How natural it looks in that garden setting. I am inspired. Stunning . . . Innovative . . . Inspirational! Oh Hooray! What a wonderful act of beauty! You got to see it for real?! Gasping. Anne, what a fascinating idea. Amazing! I pinned it to my Pinterest wall accrediting you, but let me know if that feels like I’ve overstepped copyright. But I just wanted to share how stunning it is! Don’t know if you can here the cheers of ‘ABSOLUTE AWE’ from over here, but this is truely just an amazing creation. SUUUUPERB!!!! Thanks for sharing all the lovely pics…they have helped me convince hubby that we indeed, need to visit the Shetlands in all their splendor next yr., during our Scotland tour. Truly a masterpiece. I, too, have never seen such a beautiful fence. Wow. That’s absolutely unspeakably cool. Did she say what gave her the idea? I ask because this never would have occurred to me, not in a million years. And wow, so so so brilliant! the garden with all the flowers and shovel and the lace are wonderfull. I really love da colours in da scarf at da top o dis page. Do you have any available and how much do they cost? Kerry, Kate sells the pattern to this lovely Betty Mouat Cowl on this site. It is truly a work of art. Wow. “A knitterly Eden,” indeed. Thanks to Anne for doing this, and to Kate for sharing it! Absolutely fantastic! As well as being a keen knitter I make fishing creels for one of my livings – the twine is totally weatherproof and much harder wearing than it looks – would totally cope with dogs, chickens etc. Going to get out some twine and have a go! Awesome! No other word for it. 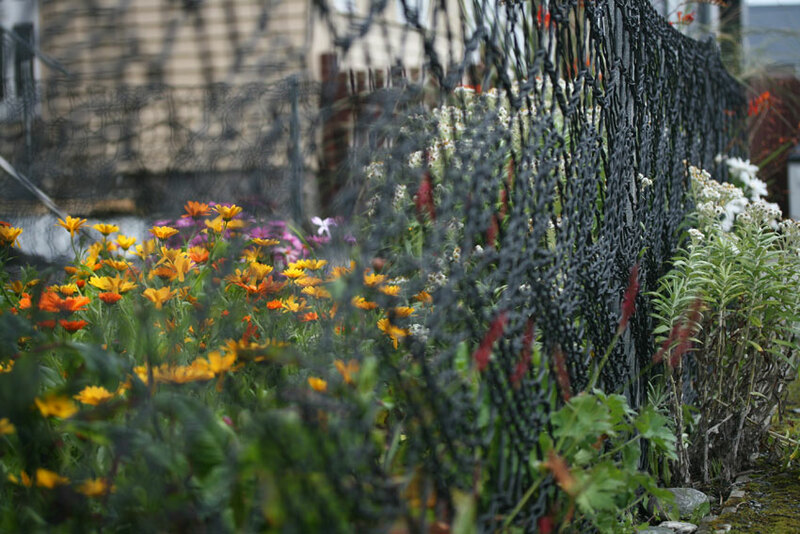 so much more lovely than the chicken wire that keeps our dogs out of my vegetables! Anne Eunson needs to create more in-depth tutorial about those curtain rods!! Like so many others, I am stunned and thrilled by this beautiful, functional knitting! I wonder if the deer in upstate New York would appreciate my efforts if I enclose my vegetable garden in knitted lace fencing next summer. I have the winter to work on it….. Fishing net twine, you say? Does it have a plastic or waxy coating so it won’t rot in wet conditions? How cool, that was the most fantastic fence I’ve ever seen! Breathtaking and brave. I can’t think of a more perfect fence. The woman is a genius. As are you for sharing it! one of the things which keeps me believing in the human race, how very beautiful. what a piece of work is man. Completely amazing. I think I might need one! very pretty, and very clever! Beautiful, stunning.. spectacular… love it ! I have seen it previously on Facebook, but thank you for the story behind the fence and even móre pictures. We’ll probably will not have the time to visit and ADMIRE this amazing piece of laceknitting, but that doesn’t mean we don’t like it! Just awesome !! I LOVE it !!! Fabulous. Am I greedy for wanting pictures of the knitter and “knitting rods” in action, too? I wonder if anyone else has ever knit a working fence. That is beyond wonderful – and so “of the place”. Thanks so much for sharing Kate-this has got to be one of the most awesome “knits” I have ever seen. I also gasped. That is quite superb. Just absolutely gorgeous! Anne’s house is going to be on all the tours this summer & will probably be the most photographed place on Burra. I think the Shetland tourist office should definitely ask Anne if they can use her garden fence in their advertisements. Thanks for telling us about this, Kate. This fence is amazing! It opens up a world of possibilities, my mind is racing! OhMyBob – how creatively, integratingly perfect! She is a clever one. She’s also got materials use down cold – good on her. Incredible. Absolutely I.N.C.R.E.D.I.B.L.E. So much love for that fence…so much admiration for Anne. This is definitely the most beautiful fence I’ve ever seen. Aren’t people ingenious. Such great lateral thinking. It really does show off the pattern wonderfully. It must have been hard graft knitting it with curtain poles, I find any needles over about 5mm difficult enough! My jaw dropped. It’s just fantastic! the creative genius behind this is amazing! The fence is simply amazing! This is an amazing fence. Thank you for sharing it with us. The prettiest fence in the whole world ever! I’m (almost) literally drooling. This is amazing!! Wow – that’s fantastic! It’s beautiful! Oh my…what a great way to express yourself. …..beautiful! This is wonderful! How did you find this fantastic fence? Is the artist a friend of yours? I blog for a local yarn shop here in Salem, MA, USA and would love to feature some of these images and link back to your post. Can we work it out? Please email me if you are interested. How delightful. You must have done a double take when you saw it first. And like others, I now want to knit a fence. Thank you so much for sharing this. It’s both fascinating and amazing. Suddenly I really really want to knit a fence. Now that’s something I never imagined myself wanting to do! OK, I now have an overwhelming desire to go out and find some fishing net twine and sharpen up a couple curtain rods. That is beautiful! Haha…I was thinking the same thing, Laura! Corgis plus knitted fence equals quick destruction! So beautiful, perhaps my yard needs a fence too!